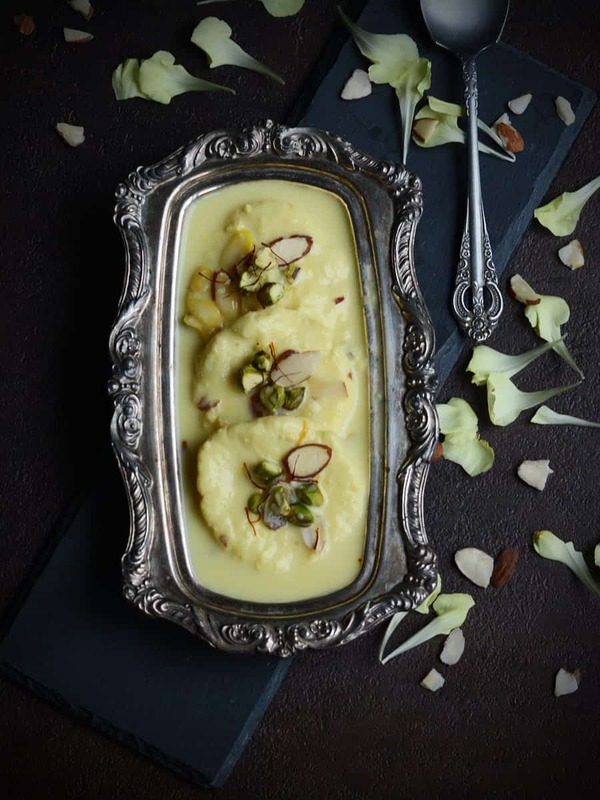 Do you know how to make this Easy Rasamalai Recipe? the process and procedure are very simple and everyone can make without any prior knowledge in making sweets. You can make it in less than an hour from start to finish. It’s definitely a very versatile and crowd pleaser recipe, you can make in large, make well in advance- a day before itself- for the parties. 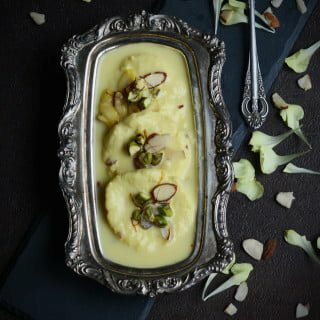 Rasamalai, a Bengali sweet/dessert made with cottage cheese soaked in thickened milk. Rasamalai is one of the sweet, which I love most mainly because of its texture, its mild sweetness. How to eat? however you like..but I would suggest cutting quarter spoon of the patties and the remaining with the ‘malai’ milk. As I told you earlier, this is the easiest dessert recipe, the quicker version needs an hour to make it. If you are planning for parties, you can make the patties well in advance. And then thickened milk later. But make sure you soak the patties in thickened milk at least for 2-3 hours in the refrigerator before serving. Usually, rasamalai will be served chilled. But there is the big crowd to serve them hot as well. Bengali sweets have a common base recipe of making cottage cheese. You can also make the cottage cheese base in large and can make other sweets like Sandesh, Rasagolla, Chum Chum. 1. Boil a littler of milk. When the milk starts foaming up, simmer the flame and add vinegar. Stir continuously until milk curdles and way water gets completely separated. Hint: I use 1% low-fat milk for making cottage cheese. 2. Using cheese cloth, separate cottage cheese, and way water. Hint: You can also use the left over way water kneading dough or in gravies. Cover it and leave it for about 30 minutes and Squeeze to remove excess water if any. 3. In the mixer grinder add this crumbled cottage cheese and run the mixer for few seconds, until it forms a smooth texture. Scrap the sides of the mixer, and transfer to a plate. Knead them again to form a smooth dough like in the picture. 4. Divide them into small equal size balls. Make them into flatten patties by pressing them gently. Make sure it has smooth edges and does not break on the sides. 5. Keep a wide pan on the stove in medium flame. Add 1.5 cups of sugar and 4 cups of water and bring it to rolling boil. When sugar dissolves completely, gently slide the patties in the pan one after the other. Cover the pan with a lid and allow it to cook for about 12-15 minutes. Flip the patties once or twice in between this cooking time. The Patties must have doubled its size now. Hint: Be gentle and careful while flipping the patties. 6. Keep it aside for about one hour to bring it down to the room temperature. Once cooled down, gently squeeze the excess sugar syrup using flatten spatulas. Keep these drained patties ready. 6. Keep a wide and heavy bottomed pan in slower flame. Add milk and bring it to rolling boil. Then add saffron and reduce the flame to simmer. Hint: Stir them frequently to prevent milk sticks to the bottom of the pan. Also keep an eye, as milk tends to overflows suddenly. 7. For about 15-20 minutes or until the milk has reduced to half of its quantity. Dilute corn flour in a tablespoon of water and add it to the milk. Give it a stir. Add sugar and cardamom powder. 8. Bring it to medium flame, add kept aside patties. Cook it for about 5 minutes until patties absorb the flavors of the milk. 9. Transfer it to another container, serve hot. Or bring it down to the room temperature and refrigerate for about 3 hours and serve chilled. 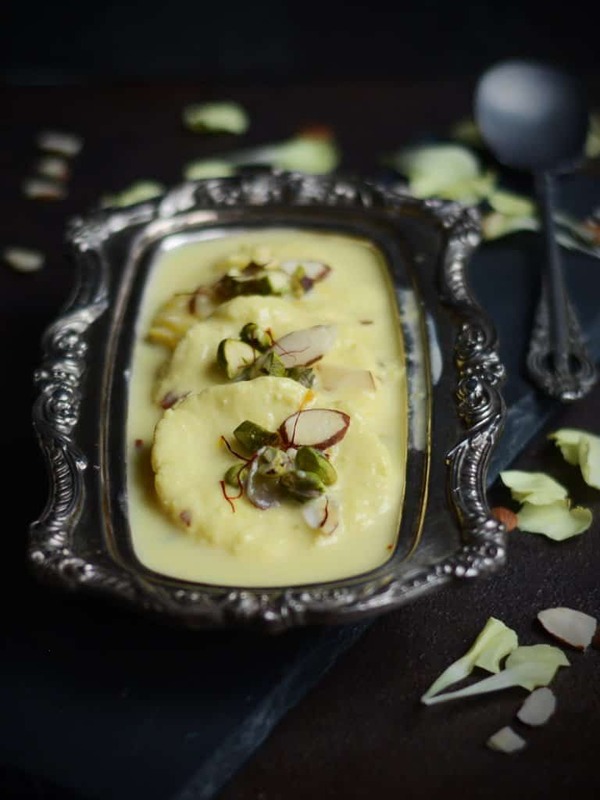 Rasamalai, a Bengali sweet/dessert made with cottage cheese soaked in thickened milk. Rasamalai is one of the sweet, which I love most mainly because of its texture, its mild sweetness. Boil a littler of milk. When the milk starts foaming up, simmer the flame and add vinegar. Stir continuously until milk curdles and way water gets completely separated. Hint: I use 1% low-fat milk for making cottage cheese. Using cheese cloth, separate cottage cheese, and way water. Hint: You can also use the left over way water kneading dough or in gravies. Cover it and leave it for about 30 minutes and Squeeze to remove excess water if any. In the mixer grinder add this crumbled cottage cheese and run the mixer for few seconds, until it forms a smooth texture. Scrap the sides of the mixer, and transfer to a plate. Knead them again to form a smooth dough like in the picture. Divide them into small equal size balls. Make them into flatten patties by pressing them gently. Make sure it has smooth edges and does not break on the sides. Keep a wide pan on the stove in medium flame. Add 1.5 cups of sugar and 4 cups of water and bring it to rolling boil. When sugar dissolves completely, gently slide the patties in the pan one after the other. Cover the pan with a lid and allow it to cook for about 12-15 minutes. Flip the patties once or twice in between this cooking time. The Patties must have doubled its size now. Hint: Be gentle and careful while flipping the patties. Keep it aside for about one hour to bring it down to the room temperature. Once cooled down, gently squeeze the excess sugar syrup using flatten spatulas. Keep these drained patties ready. Keep a wide and heavy bottomed pan in slower flame. Add milk and bring it to rolling boil. Then add saffron and reduce the flame to simmer. Hint: Stir them frequently to prevent milk sticks to the bottom of the pan. Also keep an eye, as milk tends to overflows suddenly. For about 15-20 minutes or until the milk has reduced to half of its quantity. Dilute corn flour in a tablespoon of water and add it to the milk. Give it a stir. Add sugar and cardamom powder. Bring it to medium flame, add kept aside patties. Cook it for about 5 minutes until patties absorb the flavors of the milk. Transfer it to another container, serve hot. Or bring it down to the room temperature and refrigerate for about 3 hours and serve chilled. I doubt I would be able to make this delicious and for me unusual dessert. I do love cottage cheese but never realized you could actually make a variation of it at home–thank you for the info. I’ve never had Rasamalai before and it looks and sounds delicious! Beautiful pictures. That looks absolutely delicious! I haven’t heard of this dish before and I would love to try it.